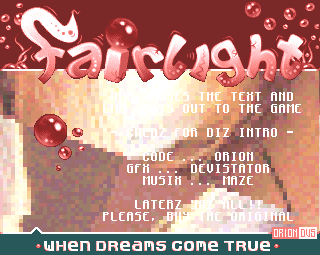 By Eltech for Fairlight featuring a sweet logo by Devistator! haha :) was converted to flash on flashtro.com a couple of years ago too..
Would loved to have had the source code, but they wouldn't give it to us, so alas we never used it. Oh well. I was just about to upload it! Great one!!! Great tune and logo, good code. page created in 0.075475 seconds with 15 queries.